Clear all 60 jellies and reach 32,000 points to complete the level. This level has medium difficulty. 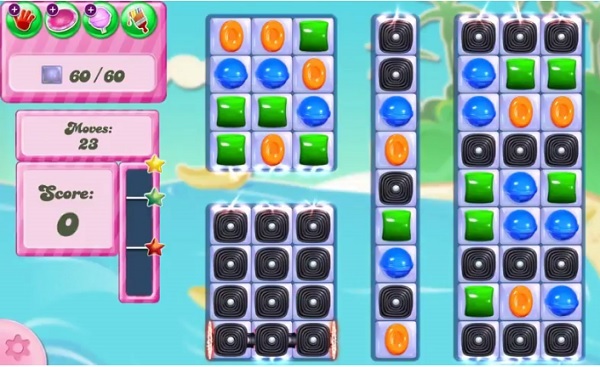 For this level try to play from where more candies are available to play to get more chance to make special candy.Try to make special candy and more striped candy to break the jellies or play near to jellies to break them all. ARE U INSANE? HOW THE HELL DO U EXPECT US TO COMPLETE THIS LEVEL WITH 10 MOVES TO YOUR 23? Can’t pass this level with only 10 moves. I fail to understand your motive reducing 23 moves to just 10 other than for players to purchase boosters. I have spent more than enough getting this far. Help please. 10 Moves are impossible. Please fix this level. Thanks!! AGAIN? I COULDNT BELIEVE IT WHEN I SAW YOU WERE SUPPOSED TO HAVE 23 MOVES!!!! How can this HAPPEN???? Impossible level with only 10 moves, Shame on you! This is ridiculous, I think the time has come to find another game Candy Crush is just after your money . Jaha 10 drag vilket jävla skämt! I completed this level on my 2nd try without boosters!! I was just very confident about the luck involved for this level. I also scored over 1100000 points!! I completed this level on my 2nd try without boosters!! I was just very confident of the luck involved in this level. I also completed this level with over 1100000 points! The person posting the videos doesn’t work for King (Candy Crush). She is just someone who passed each level when they first came out. King probably looked at the success of players like her to determine how many moves they should take away to increase the money they can make in boosters. I doubt very much that “ Candy Crush Mom” could pass the levels now. She doesn’t offer any tips of value. For heavens sake! We would never have made it this far if we didn’t already know that we should make special candies.. She just makes money off of ads and couldn’t care less if we’re struggling. I just come here to see how many moves they cut off from the original level. King is dishonest in their programming, but it won’t change because players keep buying boosters.